When considering an Outdoor Backyard or Patio Fireplace, Isokern has many options available. 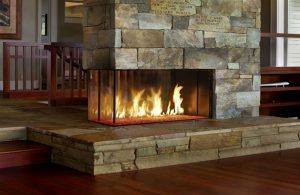 Isokern Fireplaces and Chimney Systems also offer a high insulation value as well as green clean burning efficiency. The Magnum is our most popular outdoor fireplace model due to the sheer range of sizes available. The smallest is our 28 “Mini” Magnum and it goes all the way up to our largest, the 60/72 Magnum. Our Standard, the original Isokern, has always been a crowd pleaser and is available in three sizes, with the hearth opening being slightly shorter than that of the Magnum. The Vent Free is another outdoor fireplace option and is ideal for remodels where either a flue cannot be added or in a a covered patio scenario. All three Models can be designed to fit your outdoor backyards, kitchens and patios and can be finished in a variety of materials such as brick, stone, stucco and veneers. Due to its modular make-up, the Isokern Outdoor Fireplace kits are easily installed in less than a day and are tested and listed for both wood and gas (Natural Gas or Liquid Propane) burning fireplace applications. For more information on any of our Fireplace Models, click on the name of the Fireplace Series to be directed to the appropriate page. CLICK HERE to download an Installation Manual to learn more about how to build your own Outdoor Fireplace with Isokern. CLICK HERE to view our Outdoor Gallery for Design and Finishing Ideas.